Help Id Thompson Parts Kit? I have an USGI Thompson Parts kit that came along with a package I purchased. Can somebody help me ID this kit? I think it is a 1928. It's got a quick detach buttstock. I also have a Philly Ord.? (i think) dummy receiver with it. What is the kit worth? Thanks in advance. Can't really assign an exact cost to it since I got it along with about $5k-$6k worth of rifles and parts as a package. I see them going for about $1k at OOW? and that's not including the dummy receiver. You got a 1928 parts kit. 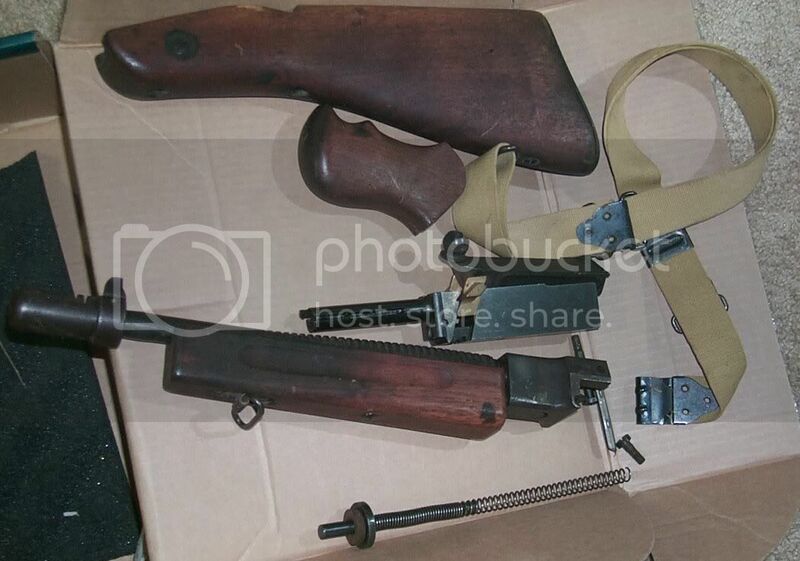 No lyman rear site so $900 for the parts kit plus the dummy receiver. Dummy could range from $150 to $500 plus depending upon who made it and if its aluminum or steel. I recently purchased the Omega 28 parts kit and it was pretty much what I expected with a few exceptions. I didn't get the 'L' sight, though I didnt really want one. The internals looked NOS but the lower frame had the serial number scratched out and re-stamped and then another serial number scraweled in, in very light scribe? The finish was not NOS and not what I had hoped for. The furniture had a few dings but not too bad. Sling hardware was milled. No receiver parts. Cutts was the later model. Luck of the draw I guess. The internals looked NOS but the lower frame had the serial number scratched out and re-stamped and then another serial number scraweled in, in very light scribe? That was common on rebuilt guns that had new grip frames installed. The frame was then renumbered to match the receiver it was placed on. Apparently, this practice was discontinued on later rebuilds. It was probably only done on the earliest rebuilds. Many of the 1928 parts kits available lately have the grip frame number crossed out and a new number inscribed. I believe these guns were rebuilt Lend-Lease guns that were completely refurbished before shipment overseas. My raeson for thinking this is that the finish is the black oxide type that was consistent with the factory originals. I suppose they could have been rebuilt overseas, as some theorize, but the barrels and compensators are usually NOS and look unfired. To me, this indicates that the guns were placed in storage and never used. 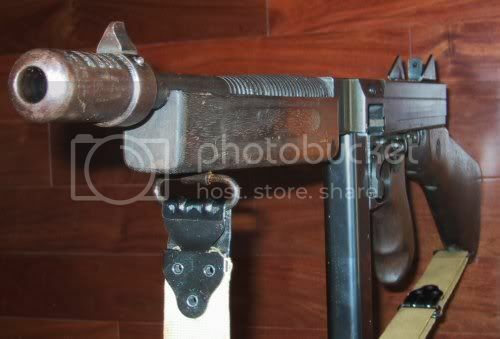 The mismatched grip frame and subsequent renumbering would be indicative of a US rebuild and shipment of a refurbished gun. That would also explain the the NOS looking internals. The finish wear on the frame and dings in the wood are probably just from long term storage. Thanks guys for the input, I didn't know I was missing the good rear sight. It has something "simple" on the dummy receiver right now. The dummy receiver I believe is a Phily Ord. STEEL receiver. That sucker is HEAVY! No way it is alumin. I think there is an ATF letter somewhere along w/ the kit that I saw that was addressed to Philly Ordnance, that's why I think it is their receiver. The only part that is not so "new" looking, that I can tell, is the barrel. It has some light surface rust and pitting near the wood handguard? areas, and although the barrel looks mirror and the grooves looks good, there is a "ring" about 1" behind the compensator? It's really hard to tell unless you look very closely down the muzzle of the rifle. One of the old collectors told me it's okay and should still be okay to shoot but it's more of a shooter grade barrel than a collector piece. The ring is created by 2 rounds hitting eachother and expanding? He said that's common. Is that right? "Sometime, try shooting a bullet that is about .002" less than bore diameter in any revolver...or pistol. It will go pf-f-ft, and it may or may not go all the way out the muzzle." That was common on rebuilt guns that had new grip frames installed. The frame was then renumbered to match the receiver it was placed on. Apparently, this practice was discontinued on later rebuilds. It was probably only done on the earliest rebuilds. .
Maybe that explains the S-17175 that is lightly scrawled onto my Colt lower, SN 12571. between the Colt SNnumber and the grip, though the original SN was not over stamped. I would be curious to know where 12571 was betwenn 1921 and the time I received the lower. "I guess I've learned again that it's not productive to debate a technical question with somebody who has never done it. It's so much easier to count the number of teeth in the mouth of an actual horse, rather to endlessly debate how many there might be. " Oops, didn't mean to start a debate here guys. I guess to be on the safe side I'll call this barrel for "display/dummy" gun use only if I put it up for sale. Just want to get enough information so I can at least describe this kit correctly.